The south leg of Newport News Shipbuilding's 1,050-ton Goliath gantry crane, also known as "Big Blue," rises into a stormy sky. Tugboat Huntington makes its way up the James River. 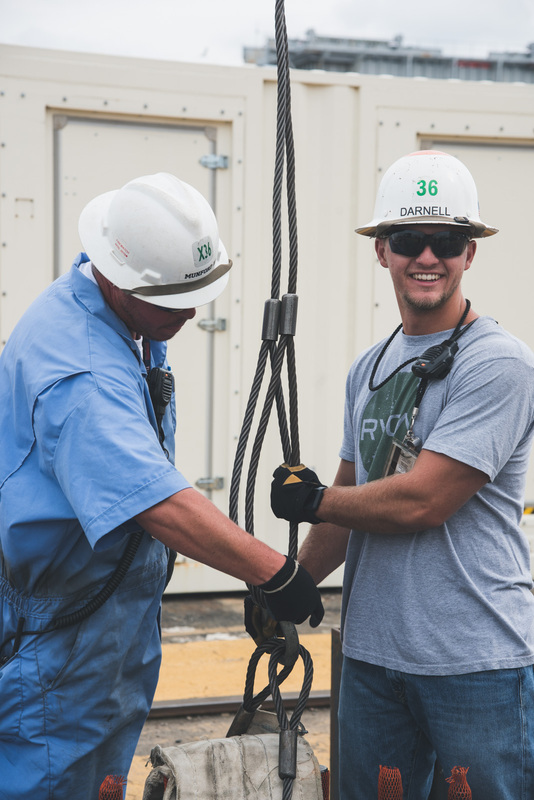 Shipbuilder Ryan Darnell shares a laugh with Herbert Munford as they release wires following a crane lift. Newport News Shipbuilding's “Spear and Gear” logo is proudly displayed at the entrance of Bldg. 86. The lower bow section of John F. Kennedy (CVN 79) sits on the platen awaiting its lift into Dry Dock 12. The vacant anchor room of decommissioned Enterprise (CVN 65) holds more than 50 years of history. Identified by its bright red bricks, Newport News Shipbuilding’s Machine Shop was built in the late 1800s, making it one of the oldest buildings in the shipyard. Shipbuilder Lorenza Doles begins grinding operations in a tight area. 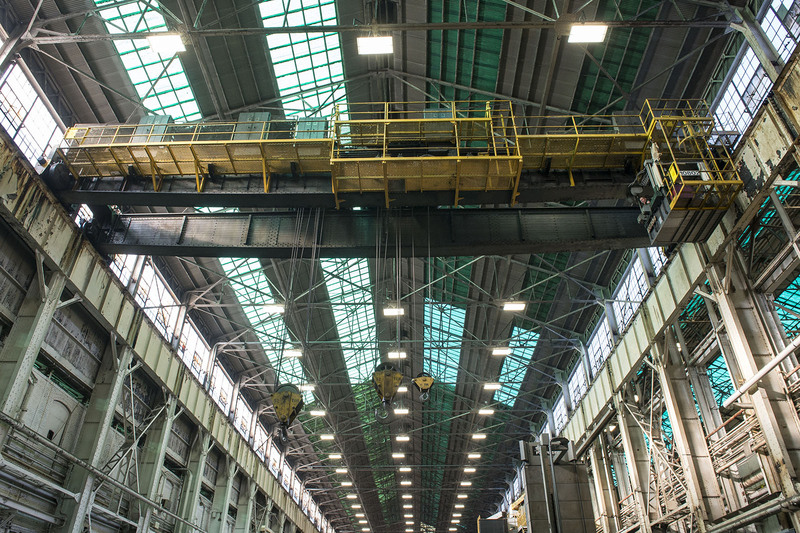 A crane in Newport News Shipbuilding’s Machine Shop sits dormant while waiting for its next lift. Captain Ambrose, one of two Newport News Shipbuilding tugboats, transports a barge into Dry Dock 12 as a part of preparations for Hurricane Florence. Green seaweed sticks to the bottom of a steel unit's beam as it rises from the James River. A C-clamp is fixed to the top of John F. Kennedy's (CVN 79) lower bow unit. Shipbuilder Vernon Bland welds a carrier unit on Platen 21. A shipbuilder welds a unit inside of a tight space in the Submarine Frame Shop. In the Main Machine Shop, Joyce Hagen takes precise measurements and applies them to the workpiece with a hammer and a center punch. Newport News Shipbuilding's Power House is seen beside Dry Dock 2 in the early morning. The walls of Dry Dock 2 tower overhead.